Iron Age silver unit of uninscribed north-eastern boar/horse type(Corieltauvian), 15mm in diameter. Section of edge missing and moderate corrosion. Obverse description: Boar right, with upright bristles along his back, his head is missing, probably due to the coin being badly struck. Iron age Silver unit, uninscribed north-eastern boar/horse type. 13-15mm in diameter. A late Iron Age silver unit of the North-Eastern uninscribed 'Boar/Horse' type, 13mm in diameter. 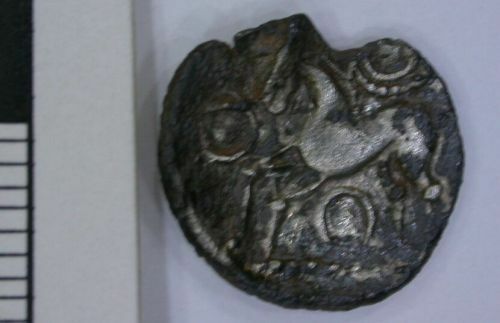 Iron Age silver unit of north-eastern uninscribed boar/horse type, 12mm in diameter.